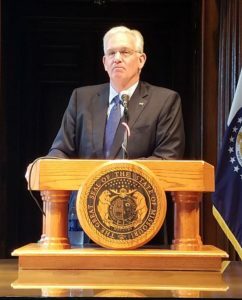 Governor Jay Nixon (D) will not travel to Europe this week, citing recent events, including the shooting of an officer in the eastern Missouri town of Ballwin. The trip included stops to the United Kingdom, Ireland and Switzerland to build business relations with the three countries. Nixon has been criticized by some for his response following the 2014 shooting death of Michael Brown, Jr. in Ferguson. Some accused him of being “missing in action” during the early days of unrest there. The governor has defended his actions and says he was involved from “very early in the process.” He also created the Office of Community Engagement to look for solutions to problems regarding race, educational and economic opportunities. Other members of the delegation will return to Missouri following the completion of meetings in Dublin. The delegation includes First Lady Georganne Nixon, Missouri House Speaker Todd Richardson (R-Poplar Bluff); Senator Dave Schatz (R-Sullivan); Senator Jason Holsman (D-Kansas City); and Representative Kip Kendrick (D-Columbia). Travel expenses for the Governor and First Lady will be covered by the nonprofit Hawthorn Foundation.